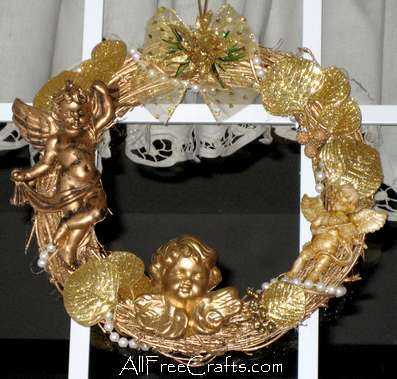 Angelic cherubs and a glittering gold monochrome theme are beautifully combined in this homemade Christmas wreath. This wreath came about because I had three angelic cherub ornaments that wouldn’t fit on the smaller Christmas tree that I am using this year. I’ve always liked these particular ornaments and I didn’t want to just pack them away, probably never to be used again. Instead, I decided to use them as the theme for a golden wreath for my front door. tened all ornaments and embellishments to a gold grapevine wreath from the dollar store, using a hot glue gun and gold glitter glue sticks, which blends in beautifully. You can also use ordinary glue sticks; just make sure that all points of contact are “behind the scenes” and can’t be seen. Begin this wreath by positioning the cherub ornaments where you like them best. Try out various arrangements until you have one that you like then glue the cherubs in place. The smallest cherub on my wreath was more white than gold, but I wanted to maintain the monochrome gold effect, so I painted it with fine gold glitter paint before gluing in place. Glue the gold bow into place at the top center of the wreath. Wrap the string of pearls around the wreath, going in between and around the cherubs. Glue down in several hidden places until the string of pearls is secure. Fill in empty spaces by gluing down gold leaves, berries, or seed pods. Finally, make a loop from gold thread or ribbon and glue it to the back of the wreath, at the center top position. Use the hanger to display your golden wreath on a door or wall.